"This is not a party, it's a celebration," Billie Joe yelled to a theater filled with Green Day and Broadway fans on Sunday April 24, 2011. Easter Sunday no less. 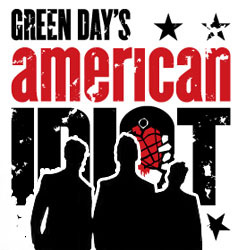 The American Idiot musical had been running at the St. James theater in New York City for just over a year. At it's start there was skepticism about whether a punk rock musical had staying power - and amongst fans, skepticism about how Green Day's music could be turned into a stage production without becoming a giant cheese ball. Walking around the St. James on closing night only highlighted the clash of cultures. Punk kids with pink, purple and bleached hair wearing an array of pins or clothes you could swear they'd been wearing the previous 5 days and every Green Day shirt out there - and celebrities, theater "folk", and people dressed nice enough to visit with the President of the United States (sorry other presidents, only ours gets the attention of the fashion savvy). I can't think of many bands right now who could possibly weave these two cultures together and create something each could equally enjoy. This was my first time seeing Billie Joe play the part of St. Jimmy, the maniacal bad side in all of us wanting to get out and burn the world around him. I had seen the musical a year before, opening night, with the original cast which included Tony Vincent playing "St. Jimmy", John Gallagher Jr. as "Johnny", Michael Esper as"Will" and Stark Sands as "Tunny". The story revolves around three friends who plan to leave their hometown, but when the other two get sidetracked by life, Johnny ends up alone in the city with only his demons to entertain. St.Jimmy comes in, showing him the fun fast life of drugs and alcohol then proceeds to watch Johnny destroy himself. Tre Cool and Dena Engaged! Fuse features Green Day in "Battle of the Fans"
New Poll: Do you want to see American Idiot made into a movie based off the musical? Win a copy of "Seize the Green Day"